SAP ERP | Fasttrack Solutions Inc. When one talks about enterprise resource planning or ERP, one most likely means the ERP product of Walldorf, Germany-based company SAP, or SAP ERP. It’s more than an alphabet soup. SAP has 40 years of innovation history and is the world leader in enterprise software and software-related services. Enterprise resource planning is one of SAP’s most popular business products – a way through which a business enterprise can integrate internal and external information to weave an accurate and compelling business story. SAP ERP works with different kinds of information from various key business units like procurement, manufacturing, service, sales, finance, and HR. SAP ERP facilitates the smooth flow of data among the various aspects of operations within the organization and also communicates to external stakeholders. It also does away with effort duplication, thus fostering efficiency, by consolidating the data. This complex package was initially designed for large companies, but more recently, mid-sized and smaller enterprises have also started using SAP ERP for their own operations. With better information management from SAP ERP comes better decision making. A business becomes more competitive and is better able to move with market trends while suiting the product to the customer’s specific needs, thus increasing satisfaction. Finally, SAP ERP enables the customer to innovate and adapt to the changing times. As a result, SAP ERP has become the product of choice for businesses in 25 industries, 37 languages and 45 localizations. SAP ERP derives its core strength from the financials component, enabling the customer to simplify and automate financial operations while gaining real-time insight into the overall performance of the company. SAP ERP also helps ensure regulatory compliance. There are no other “versions” of the financial truth according to each department or aspect of operation. With SAP ERP, there is only one story and it cannot be tweaked or modified, giving the decision makers the real picture and a sound basis for all future actions. SAP ERP also enables the company to analyze customer behavior and sales patterns so that new opportunities can be maximized and potential weak areas can be identified. With regard to human resources, SAP ERP is able to provide support for recruiting, onboarding and administration for the employees’ professional development. This boosts their moral and increases their productivity, making them even greater assets to the organization. Better manage your most valuable asset – your people – with support for recruiting, onboarding, and administration to professional development and promotion. 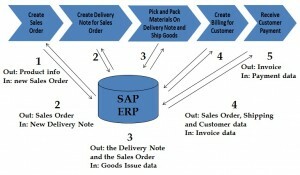 SAP ERP also streamlines and optimizes the flow of materials. Savings on costs are maximized with support for end-to-end procurement and logistics processes. These are just some of the things SAP ERP can do for a business enterprise. The list is long and gets longer every day. Looking for an SAP ERP Solution Provider? For a better understanding of SAP ERP we could set a meeting for you to see its core features. A demo will let you see SAP ERP System in action to assess critical features, pricing and the system's ease of use.